While EU accounts for ~36% of India’s auto component exports, the share of UK in Indian auto components export is a meager 5% . 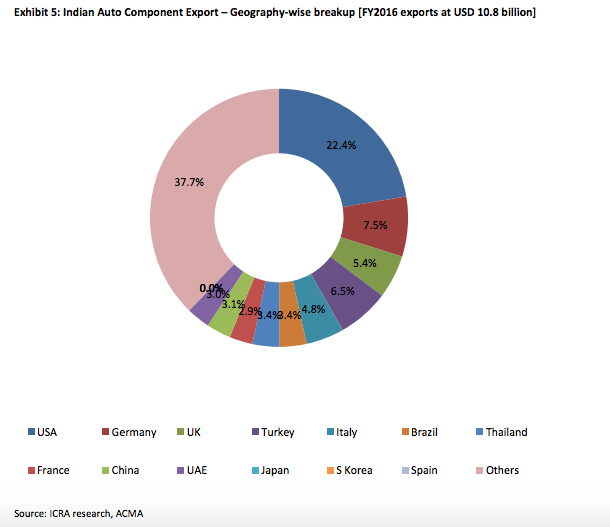 Germany, in the EU, is a bigger destination for Indian auto component exports. Hence, the impact of a potential slowdown in the UK passenger vehicle (PV) market on direct automotive component exports from India is likely to be limited. UK PV industry has been growing at healthy pace during the last few years and has achieved its ten-year-high annual production of 1.6 million during CY 2015. However, the UK PV industry is predominantly export oriented with 77% of its total cars produced being exported to overseas market; 57% of that goes to EU alone. Similarly, only one out of seven cars registered in UK is manufactured in UK, the rest being imported (1.7 million) – mainly from EU. On supply chain front, only 33% of automotive components required for the UK’s PV industry was sourced locally with the rest 67% imported, primarily (94% of imports) from EU. This highlights the strong interdependence of the UK and EU automotive industry. However, a few Indian auto ancillaries have set up manufacturing bases close to their customer in EU (including UK) to avail of the lower tariff and logistics overheads. Amongst the UK based car OEMs, Indian ancillaries have relatively higher dependence on JLR – which is UK’s largest car manufacturer and has Indian linkage, thanks to the ownership by Tata Motors. What could be impact of Brexit on Indian auto component manufacturers? Indian auto component manufacturers have a much higher exposure to European (ex-UK) CV and PV OEMs as compared to UK based OEMs. Companies supplying to EU from EU or UK from UK will not have any material impact, unless there is overall slowdown in European economy. There is a sufficient time period of 2 year+ (could be extended further) for companies to plan their future growth plans and mitigation strategies. If UK returned to World Trade Organisation rules for trade with Europe, it could result in a 10% tariff on exports and an import duty of ~4% on components. However, UK could negotiate access to the European Union market as European Free Trade Association (EFTA) member. For instance, Norway is still not a member of the EU but it has favorable access to the European Common Market, being an EFTA member.